Had Eduardo and Lilian not had a dream, I would not have my beautiful wife and our 5 beautiful children. That alone is crazy to think about. He was going to be a lawyer in Bolivia but decided to bring his family of 8 at the time to the USA. Shortly after arriving they had their 7th child and began learning English and working HARD to take care of their family. Gabby was just 2 years old when they came to Utah and her parents worked multiple jobs since 1988 here in America. When I met Gabby in 2005 she was 19 years old and her Father Eduardo was working two full-time jobs and her mom worked a full-time job as well. They are some of the hardest working people I know. Her Father is currently a Bishop of their ward and spends much of his time serving and watching over the people in their ward. They are THE BEST people I have ever known. They have always loved me as a Son and that love never waivered even though they had all the reasons to let that love go. They have been the LIGHT and true example of CHRIST to me through the hardest trial of our lives recently. Eduardo retired in January and loves doing his morning pushups and Zumba classes. 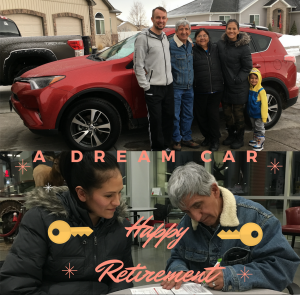 He has had a dream of getting a new car and specifically a Rav4. The only thing is that they spent their entire lives recycling cans, delivering newspapers, and many other side gigs to help support and send out missionaries when that could have been used for their family. So getting a NEW car is something we couldn’t see him doing. So we wanted to do a surprise for him while they were here for Mila’s Baptism. Gabby, Myself, Rodrigo ( Gabby’s oldest brother),and her Dad took off Saturday night without telling him where we were going. We arrived at the Toyota Dealership at about 7:40 and the RAV4 in the color he loves best was in the loading garage. Her brother played the part that HE was shopping for a new car and wanted to look at this specific car. We asked questions to Eduardo for near an hour as we looked at it, test drove it, and talked about it if would be a good reliable car for Rodrigo’s family. He would ask Eduardo, “Would you get this car?” “Is there another one you think would be best for us?” and so forth. After about an hour we KNEW it was the car he would get if it was possible. We began filling out the paperwork for Gabby’s brother. The time came to get the drivers license for the Title. We asked the salesman to leave for a moment so that we could talk about it for a minute. The moment that followed will forever be etched in mind. He dropped his head and was overwhelmed with tears. I’ve never witnessed so much gratitude in my life. 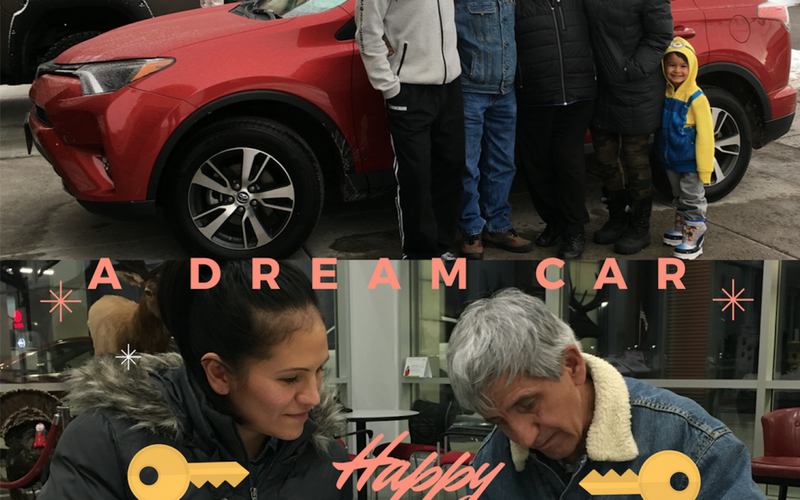 We paid for the car in full and headed home where HE then got to surprise his beautiful wife Lilian with their new car. I will never forget the words that Gabby’s mother spoke to us about how the most important gift we could ever give them is to continue becoming a stronger couple and family so that we can spend eternity together. The car is a nice gift but it can’t be taken to the next life. I promised them both that I will ALWAYS honor, love, and continue becoming the best spouse I can for their beautiful daughter Gabby. Ps Dad, you now have the red car you’ve always wanted  yay!! !